4 Oct: UberEats couriers, Uber drivers and supporters occupied the lobby of Uber's offices today, as part of the Fast Food Shutdown national day of action. The protest was supported by the Independent Workers Union of Great Britain (IWGB) and the Industrial Workers of the World (IWW). Around 50 people did a surprise protest in the lobby of Aldgate Tower, where Uber's UK headquarters are based. The protesters stayed in the lobby for almost an hour doing a series of chants, including “Uber, Uber you can't hide, we can see your greedy side” and “Five pound per drop or the work will stop”. The occupation happened as part of a national day of action, with UberEats couriers striking across eight cities. The couriers are striking alongside workers from McDonald's, TGI Fridays and Wetherspoons. More information here. UberEats couriers are demanding £5 pounds per delivery and £1 for every additional mile travelled. Today's strikes follow industrial action by UberEats couriers in London on 19,20 and 21 September. Uber drivers demanding for an end to unfair dismissals and that the company employ them as limb (b) workers rather than independent contractors, were also at the protest. 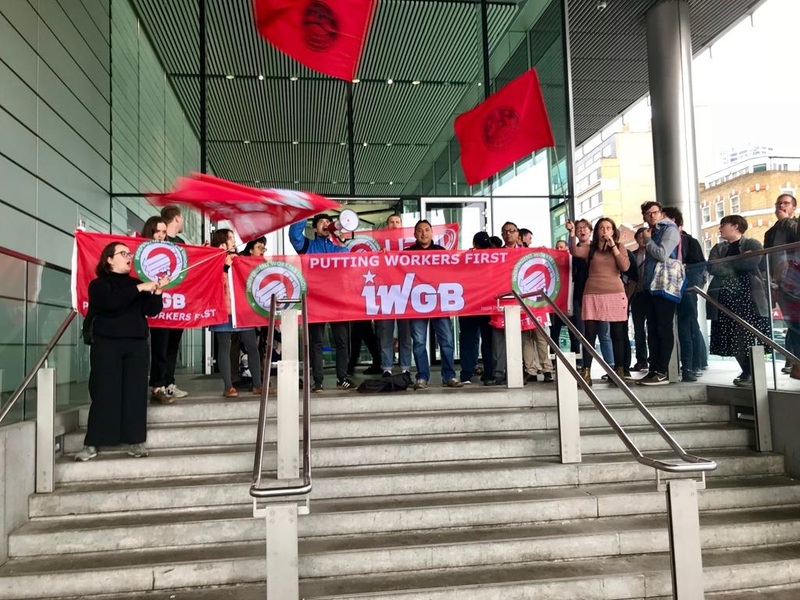 The Employment Appeal Tribunal ruled last year that IWGB members and former Uber drivers Yaseen Aslam and James Farrar were limb (b) workers, with the right to a guaranteed minimum wage and holiday pay, among other rights. The company is appealing the decision with a case scheduled at the Court of Appeal for 30 and 31 October. The IWGB's United Private Hire Drivers (UPHD) branch is organising a strike of Uber drivers in London for 9 October. IWW communications officer James Camps said: "Unions and couriers working together showed their collective determination to win today. By delivering the couriers' demand for £5 per delivery right to their doorstep we ensured that Uber cant ignore us - your move Uber."